Today, Google announced that they are adding Gmail support to Google Sync. This will allow users to get push notification for their Gmail emails on both the iPhone and iPod touch. If you already have Google Sync set-up on your iPhone for syncing Contacts and/or Calendar… you should be able to just toggle the Mail option On and the push notification will be automatically enabled. 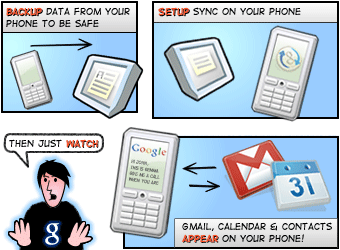 If you do not have Google Sync set-up yet, check out Google’s guide HERE. Google Sync does use an Exchange account so, if you already have one Exchange account set-up on your device… you are out on Google Sync. You can check out Google’s Mobile Team blog entry HERE, their Enterprise blog entry HERE and get more info about Google Sync and the iPhone HERE. I know that push doesn’t work on unlocked iPhones for most things, but does it work for Exchange? This does not work, lost all contacts and calendar data. Can’t sync them back, even when I delete the ME account and start again. Really annoying. Not sure if its a google server error or an iPhone 3.1 error. Now I just need one for hotmail. Microsoft is so stubborn! That part where you guys said that if you already have an exchange account set-up then push gmail will not work it’s wrong…. You just can’t have 2 gmail exchange accounts cause they run off the dame server. Mobil me or any other exchange accounts will still work. It works perfectly for me. Bye bye MobileMe. I set it up yesterday and the push was slow at first and slow to load my inbox. Yesterday evening push started working perfectly (right along with my MobileMe during test emails), but loading of emails in my folders isn’t working well. Some folders have some emails in the and some have none. Figure I will give it through the weekend to load everything. It will be nice to turn off the fetch every 15 minutes now.